Enjoy an afternoon tea party with our exquisitely designed Royal Victoria tall mug. Made in the UK from bone china, the design is inspired by Queen Victoria's Honitons lace wedding flounce which she wore for her wedding. The design also features her iconic crown to complete a truly captivating look. This crown features in many portraits and pictures of Queen Victoria as it was specially designed for her as part of her mourning wear. The crown can now be seen at the Tower of London. Delivered with a gift box, the mug is made exclusively for Historic Royal Palaces in the UK. The mug measures 15cm x 10cm. The exquisite bone china mug is made in England exclusively for Historic Royal Palaces. The golden design is inspired by one of Queen Victoria's most iconic crowns and by her Honiton lace wedding flounce which she wore for her wedding in 1840. 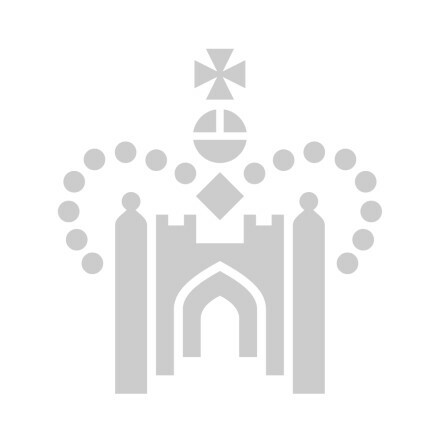 The crown became an iconic feature of Queen Victoria's regal wear in the latter part of her reign and now the crown can be seen at the Tower of London. Our tall mug is excellent for having a larger brew with a truly inspiring design. Made exclusively for Historic Royal Palaces in the UK. Includes gift box. Tall mug dimensions: 15cm x 10cm. Not safe for dishwasher or microwave - hand wash only.